I have been in the fire service for nearly twenty-five years and currently a Captain for a career department in a suburb of Chicago, IL. As founder of Firefighter Behavioral Health Alliance (FBHA) and a licensed counselor I began to notice, even within myself, about the behaviours of the men and women in the fire service. The examples of behaviors such as being caretakers, risk-takers, proud, dedicated, self-sacrificing, and brave are just a few to mention. Notice how behaviours can be positive ones? Sometimes when people hear the word “behaviours” they tend to think negatively at first. Yet, the behaviours can be based on the cultural brainwash. From our first days in our uniform or in the academies, we are trained to act with bravery, honour, self-sacrificing, show no weakness, keep emotions in check and be a firefighter that stands proud. So the question is, are we trained this way or do we succumb to peer pressure and a history of the fire service culture? I believe every firefighter has had the same experience and that is they can go anywhere and be told by people in the general public just “how brave you are” and that “we admire your courage” or “you are real hero’s” and so on. As humans, who are firefighters and EMT’s, we have the tendency, to not only believe we must act a certain way around the firehouse, but also in the public’s eyes. We then begin to conform to the way we act, which incorporates our personal lives meaning, we need to act this way 24/7. Since we believe we must not show weakness, keeping all the tragic images inside us, or issues we deal with in our personal lives, our communications tend to lack on how we feel, and then we decide to “handle” our problems on our own. With that we might fall prey to addictions, stress, depression, post traumatic stress disorder (PTSD) or even suicide. The Firefighter Behavioral Health Alliance, a non-for profit, was founded in 2011. We are the only known organization in the United States and perhaps globally, that collects data on firefighter/EMT suicides. We do this for numerous reasons but the top two are to never forget our brothers and sisters who suffered so deeply that they felt the only way to escape their darkness, pain, guilt, shame or suffering by taking their lives. The second reason is to learn what are the issues they were facing that caused these tragedies and how can we learn from them? On our FBHA web page (www.ffbha.org) we have a confidential reporting system where firefighters, chiefs, friends or family members can submit a confidential report about the loss of a firefighter or EMT. We do not require names for our data. We do however require the following so we can validate that such event has happened which are year, fire department, state or country, age, rank, method, active or retired, and known reason for suicide. In the chart below you will see the most documented reason was “unknown”. The second and third causes are depression and relationship issues. FBHA takes all of the information and develops our FF/EMT suicide awareness/prevention workshops around the collected data to educate my brothers and sisters. The workshop titled “Saving Those Who Save Others” has been very successful across America. Yet, the credit for the success is due to fire departments and Emergency Medical Services organizations, which are becoming proactive in wanting to educate their members. This is a switch in our culture, in which there has been a shortage of training on behavioral health. 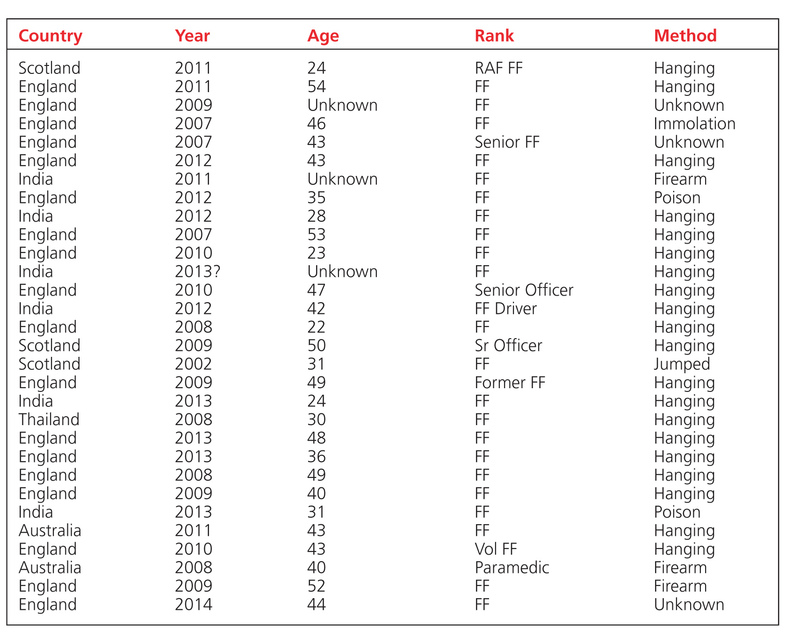 As indicated earlier we keep stats on other information and what we found surprised us especially in two areas – one being retired firefighters who take their lives. Within this subject I could write for pages. We felt it was so important that we now include a section of our workshops to retirement and after interviewing firefighters who retired we found there was a lack of planning on their part. This was not financial, but emotional which included a detachment from a culture and lifestyle. FBHA promotes to fire departments and EMS organizations to begin looking seriously into the issues of extending counseling options to retirees to deal with the detachment issues, emotional loss or perhaps Post-Traumatic Stress that might be occurring. When one retires from years of service the tragedies and horrific images are not left at the door. They are carried for a lifetime! As for our second surprise it concerned the ages of our firefighters/EMT’s that have died. In society many studies have shown that it is typically an older male that leads the way in stats for suicides. Within our data, and due to age limits within the fire service, FBHA still found it surprising that the age groups were fairly even across the board. The FBHA validates all reported suicides to us. The most common validation when the suicides are recent is through conversations with the fire chief or designee from that department or organization. They are difficult calls to make but the issue needs to be addressed. FBHA has found that 99.9% of the fire chiefs have openly discussed the issue since they know we are not requesting names of the deceased. FBHA started tracking global suicides since countries as far away as Australia have contacted FBHA although these documentations are normally made through media stories. Isolation: Watch for those members who seem to disengage from either their fire department friends or their personal family members. Loss of Confidence in Skills: These were competent FF/EMT who could not remember how to put their pumps in gear, forgot drug administration policies, or Incident Commanders who feared going on calls because they lacked confidence in their abilities. Sleep Deprivation: Both at the firehouse and at home. Anger: We know there is anger in the firehouse. We typically try to avoid members who display anger but these are signs of other issues. Impulsiveness: Watch for members who display a change in actions or words. Example: A member who has been anti-gun yet one day decides to go and buy some handguns and a rifle for some unknown reason. The themes behind FBHA workshops are: Challenge with Compassion and Be Direct. Firefighters and EMT are blessed with what we call “Gut Instinct”. It is best to use this when you hear or see one of your own acting differently than previous times. It is then we need to Challenge with Compassion and Be Direct. Find out what is going on. You can do this through a non-evasive form of communications. We are taught that it is always better to be proactive than reactive. This becomes even more important when it involves either one of our own members or us that are struggling emotionally. There are numerous fire and EMS organisations who utilise Employee Assistance Programs (EAP). As a licensed counselor I have found that most counselors are great people yet do not understand the culture and lifestyle of firefighters and EMT’s. This unfortunately translates into many EAP organizations, hired by City Halls or Villages are not prepared to deal with firefighter issues. Most EAP organisations are selected by the lowest bid. Fire Departments and EMS organisations need to be more involved in the selection process. They need to become involved in the interview phase of selection to ask the bidding EAP organization if they have counselors who are familiar with or have dealt with the fire service culture. Also, find out if there is a Chaplain who wants to be involved within your organisation. Plus do some investigating to see if there are qualified counselors that live in your community who work with firefighters. Create a resource list for your members. Once again, being proactive produces the best results for our members. If, as Incident Command, I ask you to take a fully charged two and a half inch line to the third floor by your self, could you do it? I doubt it! You would need to ask for help. So what makes anyone think they can handle stress, anxiety, depression, PTSD or suicidal thoughts by themselves? You can’t. You need to ask for help!